As Malaysia continues to develop and advance as both a vibrant economy and a diverse community, social dynamics within the country are likely to become more complex as well. Social Innovation is one of the six strategic thrusts in achieving a developed status for the country as outlined in the 11th Malaysia Plan (11MP), in the creation of a dynamic Social Economy for the future. Much has been expounded on the topic of Social Economy around the world but much ground has yet to be explored in this vital sector of the economy in Malaysia, which for now is in its early development phase. “Agensi Inovasi Malaysia (AIM) is strategically placed to contribute to the delivery of this commitment because the agency’s strategy for embedding innovation covers all the major sectors for national development in society, industry and academia”, says Encik Naser Jaafar, CEO of AIM. In one of its social innovation initiatives, AIM uses the Public-Private-Partnership (PPP) method of matched funding, applying this method to fund social initiatives at a ratio of 50% funding from the government and 50% funding from the private sector. The Social PPP Fund is an initiative under the National Blue Ocean Strategy (NBOS) in collaboration with the Public Private Partnership Unit (UKAS) to fund effective and innovative social interventions delivered by the private sector. AIM commits its resources for innovative mind enrichment of children and adults with disabilities as well those beset by poverty. Cultivating a Thinking Culture and Innovation for, and by Society are two of AIM’s main thrusts that underlie this commitment in creating Malaysia’s own innovation ecosystem, based on knowledge and creativity. AIM’s approach seeks to extend the act of learning beyond its role as a preparatory stage for a productive life, into a life-long experience that will continue to enrich the mind. In a nutshell, the agency’s collaborations with Social Purpose Organisations (SPOs), corporations, and academia is to inculcate the art of learning in society. A recent case in point, is a group of 200 students participating in a joint after-school STEM (Science, Technology, Engineering and Mathematics) programme bu AIM, IOI Group and Chumbaka Sdn Bhd. In front of an audience of about 6,000 visitors at a “School of the Future” event, they demonstrated mobile applications for library management, bookkeeping and tracking of attendance that they had designed themselves. Rather than just experience daily schooling the students delved into projects that gave them a taste of combining curiosity and creativity, and would hopefully launch them on a life-long learning curve about what makes the world tick. The less able can also become enablers of future progress and development, if only they are first enabled themselves. AIM collaborates in initiatives that help empower the disabled. Apart from the after-school STEM programme,the agency is focusing on collaborations that benefit the disabled as well. Digi Telecommunications Sdn Bhd and BAXS Technology recently launched EDDY (Edugame & Dictionary for Deaf), a sign language mobile app for the deaf and their family members, based on the Malaysian Sign Language. While there are various apps to learn sign language, EDDY localises and gamifies signing to provide a more fun and convenient mobile application method of learning for the deaf, especially children. The House of Light is another AIM-funded initiative in collaboration with DID MY Innovations Sdn Bhd and Save Ones Sight Missions Berhad to equip and enable disabled or underprivileged children and youths to gain productive employment and enterprise opportunities. To date, there are more than 150,000 disabled or underprivileged children and youths in our nation with minimal opportunities to receive good education and job prospects. Another project completed in 2017 was the creation of a library for the autistic at the National Autism Society of Malaysia’s centre in Melaka. This work was in collaboration with Kelab De’ Best, UiTM Melaka and co-funded by Suria Mekar Sdn Bhd, a subsidiary of TH Plantations Berhad. 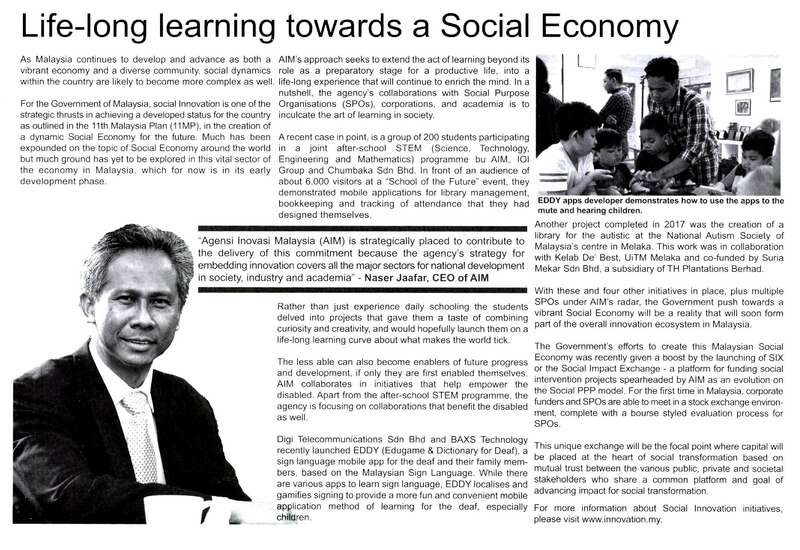 With these and four other initiatives in place, plus multiple SPOs under AIM’s radar, the push towards a vibrant Social Economy will be a reality that will soon form part of the overall innovation ecosystem in Malaysia.